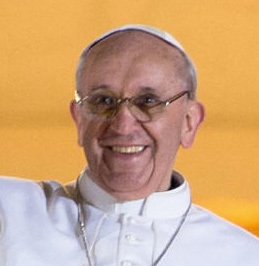 CARDINAL Jorge Mario Bergoglio, S.J., POPE Francis I, archbishop of Buenos Aires, Argentina, Ordinary for Eastern-rite faithful in Argentina who lack an Ordinary of their own rite, was born on 17 December 1936 in Buenos Aires. He studied as and holds a degree as a chemical technician, but then chose the priesthood and entered the seminary of Villa Devoto. On 11 March 1958 he moved to the novitiate of the Company of Jesus where he finished studies in the humanities in Chile. In 1963, on returning to Buenos Aires, he obtained a degree in philosophy at the St. Joseph major seminary of San Miguel. Between 1964 and 1965 he taught literature and psychology at the Immacolata College in Santa Fe and then in 1966 he taught the same subjects at the University of El Salvador, in Buenos Aires. From 1967 to 1970 he studied theology at the St. Joseph major seminary of San Miguel where he obtained a degree. On 13 December 1969 he was ordained a priest. From 1970 to 1971 he completed the third probation at Alcala de Henares, Spain, and on 22 April 1973, pronounced his perpetual vows. He was novice master at Villa Varilari in San Miguel from 1972 to 1973, where he also taught theology. On 31 July 1973 he was elected as Provincial for Argentina, a role he served as for six years. On 20 May 1992, John Paul II appointed him titular Bishop of Auca and Auxiliary of Buenos Aires. He received episcopal consecration in the Cathedral of Buenos Aires from Cardinal Antonio Quarracino, Apostolic Nuncio Ubaldo Calabresi, and Bishop Emilio Ognenovich of Mercedes-Lujan on 27 June of that year. On 3 June 1997 he was appointed Coadjutor Archbishop of Buenos Aires and succeeded Cardinal Antonio Quarracino on 28 February 1998. He was Adjunct Relator General of the 10th Ordinary General Assembly of the Synod of Bishops, October 2001. He served as President of the Bishops' Conference of Argentina from 8 November 2005 until 8 November 2011. He was created and proclaimed Cardinal by Blessed John Paul II in the consistory of 21 February 2001, of the Title of S. Roberto Bellarmino (St. Robert Bellarmine). IN 1973, at the unusually young age of 36, Francis – still known as Jorge Mario Bergoglio – was named head of the troubled Jesuit province of Argentina. His charismatic personality and popular touch drew young men to the order but alienated the Jesuits clustered around the Centre for Social Research and Action. They desired a more structural approach to Argentina’s political problems and a more intellectual perspective on the Catholic faith. Francis ignored their grumbling as he instituted a programme of reform, but his achievement proved more fragile than anyone expected. When he stepped down, he was succeeded by an ally who supported him in his new role as rector of the school of Jesuit formation. Yet Francis’s opponents soon convinced Peter Hans Kolvenbach, the superior general of the Society of Jesus, to install one of their own as head of the Argentine Jesuits. Then they moved against Francis. The future pope was exiled to Germany, ostensibly to do doctoral work on the German philosopher Romano Guardini, but really to avoid stirring up trouble at home. When he returned, his opponents found another way to isolate him. In 1990, he was sent to the remote mountain town of Córdoba. In 1992, he was asked to stop living in Jesuit residences. At that point, his failure was complete. In only a few years, and despite immense popularity during his tenure, Francis had been repudiated by the institution he had once led. Because he had failed to entrench his reforms or secure the cooperation of indispensable allies, all his work was undone.